If you’ve decided to add a new betta or Siamese fighting fish to your family, there are a few important supplies to bring home and set up before you head out to adopt your finned friend. This mini-guide will take you through getting ready for the new arrival, as well as the basics of continued care for your betta. Since these beautiful fishes can live two or three years if properly cared for, do the bad-tempered betta a favor by welcoming it into your home the best way possible. When it comes to picking out a home for your new betta, bigger really is better. That crappy little plastic cup that your fish was displayed in was just that- a display case. 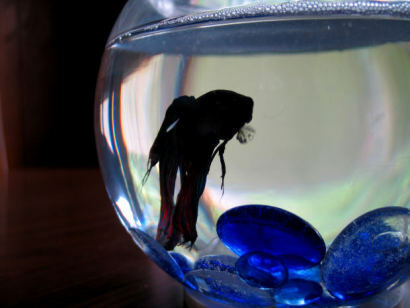 A betta needs at the very least one or two quarts of water to thrive, while one to five gallons would be optimal. For example, this 1.5 gallon beauty is an excellent choice for the beginner betta owner, due to its roomy interior and modern design. Larger tanks or aquariums make for happier fish and will allow owners to clean their enclosure only once a week, vs. several times a week for bettas living in dinky bowls. Generally Siamese fighting fish are kept in smaller containers because the pretty male bettas are hostile towards other fish and the fact that they often drift to the water’s surface to breathe air. If you can, splurge for the larger freshwater aquarium for a cheerier and healthier betta in the long run. Don’t forget to pick out some stylish aquarium gravel or jewels for the bottom of the tank, a real or fake plant for the fish to hide in for privacy and a little net to transfer the fish around for cleaning time! Even if bettas are easy to feed, you can’t forget their daily meal! 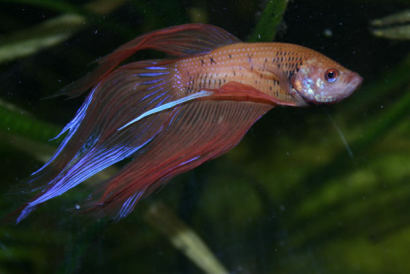 While Siamese fighting fish may prefer live bloodworms (mosquito larva), brine shrimp or plankton from the pet store, feel free to give your betta general flake or pellet based fish food- Especially if you feel that feeding your fish live larva is gross! Be sure to follow the feeding instructions on your fish food to prevent overfeeding. My personal choices, and no- I did NOT taste test them, are a combination of Aqueon’s pellet based food and Tetra brand bloodworms for a healthy and balanced diet. Take care of your attractive betta, and you will have a frilly friend for many years to keep you company wherever you place it. Just be sure to keep a male away from other males, to clean the tank frequently and to provide the betta the best food available, and you should be A-OK! Have fun, fish fanatics!